www.engadget.com wants to tell the true story behind the technology. 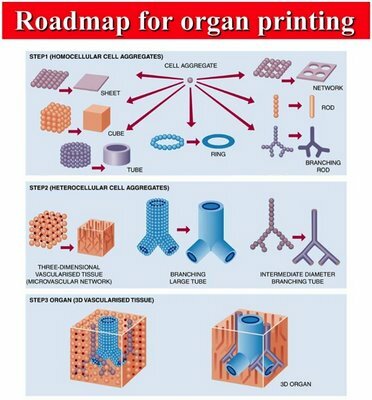 Beginning with "building blocks" printed at the Wake Forest Center for Regenerative Medicine in the late 1990s, bladder cells were printed for the purposes of study. Later, scientists at Clemson University began printing the actual 3-D organs. In 2007, the biomedical company Organovo began creating slices of human livers for testing. After CAT and MRI scans to determine the size and placement of the organ needed, scientists use stem cells as well as other non-organic printable material (such as titanium) to craft the part in question. Live cellular organisms are then put into incubators to help aid their growth and cell fusion. Of course, the organs still require acceptance by the body to go into action. As Cornell engineer Hod Lipson is quick to point out: "You can put the cells of a heart tissue in the right place together, but where's the start button? The magic happens after the printing has taken place." 78,837 people currently await organ donations, although only 3,407 donations have been created organically since January of this year. Hopefully this new onslaught of organ technology will make breakthroughs in time to save lives. The smallest elements of a freshly-printed organ. I hope the aircraft users are like to do this and they are be more interested to know this others. Because this is so need and they can do it easily now. I know this is important for all users.